[DORR WAR]. Pamphlet. 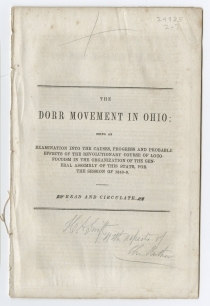 The Dorr Movement in Ohio; Being an Examination into the Causes, Progress and Probable Effects of the Revolutionary Course of Locofocoism in the Organization of the General Assembly of This State, for the Session of 1848-49. [Columbus, Ohio]: Legg & Murray, Columbus, . Disbound. Inscribed in pencil on the title by H.A. Swift, the author, in presentation. The Locofocos were a faction that split from the New York Democratic party in 1835 after local disagreements with machine politicians and Tammany Hall’s support of Andrew Jackson’s stance on the national bank. They opposed state banks, monopolies, exclusive privilege, and other antidemocratic measures. They also advocated suspending paper money and legal protection of labor unions. In New York, the machine politicians ultimately prevailed by co-opting their principal issues and nominating fusion candidates and reabsorbing the dissidents by 1838. 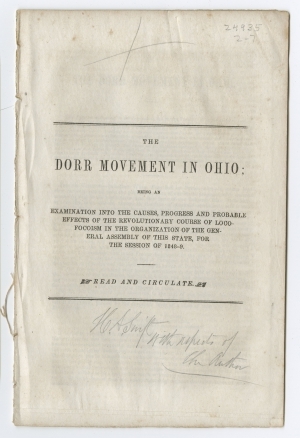 The anti-bank, anti-corporation, and increased democracy movement gained steam in neighboring Ohio throughout the 1840s, with many looking to the Dorr movement in Rhode Island as a template for their own acts. In 1841 Rhode Island’s Thomas W. Dorr had led the effort to change Rhode Island’s political system and expand voting rights. After trying to change the system internally, he created the People’s Party, held an extralegal constitutional convention, and set up a competing government. 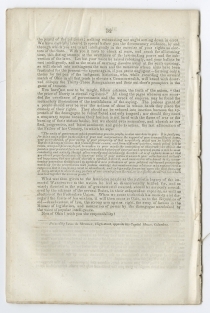 The Rhode Island General Assembly drafted a rival constitution, and in 1842, both groups voted on their respective Constitutions. Both Dorr and sitting Governor Samuel Ward King were elected governor, but King refused to accept the People’s Constitution, declared martial law, and accused Dorr of treason. While he did not attempt to seize the State House or governmental institutions, a few armed clashes did occur. Dorr fled the state, but returned and was convicted in 1843 but released for health reasons two years later. Ultimately, Rhode Island greatly liberalized voting rights in the aftermath of the rebellion. NAIP 358662. The American Antiquarian Society lists another edition, with slightly different imprint, with 1848 date.